For other uses, see Emerald (disambiguation). Emerald is a gemstone and a variety of the mineral beryl (Be3Al2(SiO3)6) colored green by trace amounts of chromium and sometimes vanadium. Beryl has a hardness of 7.5–8 on the Mohs scale. Most emeralds are highly included,  so their toughness (resistance to breakage) is classified as generally poor. Emerald is a cyclosilicate. Emeralds tend to have numerous inclusions and surface breaking fissures. Unlike diamonds, where the loupe standard, i.e. 10× magnification, is used to grade clarity, emeralds are graded by eye. Thus, if an emerald has no visible inclusions to the eye (assuming normal visual acuity) it is considered flawless. Stones that lack surface breaking fissures are extremely rare and therefore almost all emeralds are treated ("oiled", see below) to enhance the apparent clarity. The inclusions and fissures within an emerald are sometime described as jardin (French for garden), because of their mossy appearance. Imperfections are unique for each emerald and can be used to identify a particular stone. Eye-clean stones of a vivid primary green hue (as described above), with no more than 15% of any secondary hue or combination (either blue or yellow) of a medium-dark tone, command the highest prices. 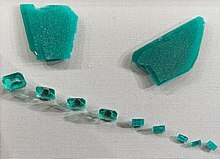 The relative non-uniformity motivates the cutting of emeralds in cabochon form, rather than faceted shapes. Faceted emeralds are most commonly given an oval cut, or the signature emerald cut, a rectangular cut with facets around the top edge. Colombia is by far the world's largest producer of emeralds, constituting 50–95% of the world production, with the number depending on the year, source and grade. Emerald production in Colombia has increased drastically in the last decade, increasing by 78% from 2000 to 2010. The three main emerald mining areas in Colombia are Muzo, Coscuez, and Chivor. Rare "trapiche" emeralds are found in Colombia, distinguished by ray-like spokes of dark impurities. Zambia is the world's second biggest producer, with its Kafubu River area deposits (Kagem Mines) about 45 km (28 mi) southwest of Kitwe responsible for 20% of the world's production of gem-quality stones in 2004. In the first half of 2011, the Kagem Mines produced 3.74 tons of emeralds. Gachalá Emerald, one of the largest gem emeralds in the world, at 858 carats (171.6 g). Found in 1967 at La Vega de San Juan mine in Gachalá, Colombia. Housed at the National Museum of Natural History in Washington, D.C.
Large, di-hexagonal prismatic crystal of 1,390 carats uncut with a beautiful deep green color. It is transparent and features few inclusions in the upper 2/3, and is translucent in the lower part. Housed at the Mim Museum, Beirut, Lebanon. 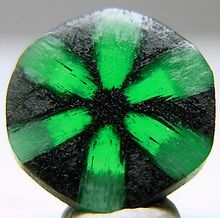 ^ a b c "Emerald at Mindat". Mindat.org. July 19, 2010. Archived from the original on July 12, 2010. Retrieved July 30, 2010. ^ a b Hurlbut, Cornelius S. Jr. and Kammerling, Robert C. (1991) Gemology, John Wiley & Sons, New York, p. 203, ISBN 0-471-52667-3. ^ "Emerald Quality Factors". GIA.edu. Gemological Institute of America. Archived from the original on November 2, 2016. Retrieved November 1, 2016. ^ Harper, Douglas. "emerald". Online Etymology Dictionary. ^ a b c Wise, R. W. (2001) Secrets of the Gem Trade: the connoisseur's guide to precious gemstones. Brunswick House Press, p. 108, ISBN 0-9728223-8-0. ^ Read, Peter (2008) Gemmology, 3rd rev. ed., NAG Press, p. 218, ISBN 0719803616. ^ Bonewitz, R. (2005). Rock and gem. New York: DK Pub. pp. 292-293. ISBN 0756633427. ^ Emerald Quality Factors Archived February 23, 2014, at the Wayback Machine. Gemological Institute of America. ^ a b "Guides for the Jewelry, Precious Metals, and Pewter Industries". U.S. Federal Trade Commission. May 30, 1996. Archived from the original on September 7, 2008. Retrieved July 30, 2010. ^ Read, P. G. Gemmology. Elsevier. p. 180. ISBN 9781483144672. Archived from the original on March 31, 2017. Retrieved March 30, 2017. ^ Matlins, Antoinette Leonard; Bonanno, Antonio C. Jewelry & Gems, the Buying Guide: How to Buy Diamonds, Pearls, Colored Gemstones, Gold & Jewelry with Confidence and Knowledge. Gemstone Press. p. 126. ISBN 9780943763712. Archived from the original on March 30, 2017. Retrieved March 30, 2017. ^ Giuliani G, Chaussidon M, Schubnel HJ, Piat DH, Rollion-Bard C, France-Lanord C, Giard D, de Narvaez D, Rondeau B (2000). "Oxygen Isotopes and Emerald Trade Routes Since Antiquity" (PDF). Science. 287 (5453): 631–3. Bibcode: 2000Sci...287..631G. doi: 10.1126/science.287.5453.631. PMID 10649992. Archived (PDF) from the original on August 7, 2011. ^ "Romans organized the mines as a multinational business..." Finlay, Victoria. Jewels: A Secret History (Kindle Location 3098). Random House Publishing Group. Kindle Edition. ^ Badawy, Manuela (June 13, 2012). "Emeralds seek the 'De Beers' treatment". Reuters. Archived from the original on December 19, 2012. Retrieved June 14, 2012. ^ Dydyński, Krzysztof (2003). Colombia. Lonely Planet. p. 21. ISBN 0-86442-674-7. ^ Wacaster, Susan (March 2012). "2010 Minerals Yearbook: Colombia [ADVANCE RELEASE]" (PDF). United States Geological Survey. Archived (PDF) from the original on August 13, 2012. Retrieved August 7, 2012. ^ Emerald Mining Areas in Colombia Archived September 29, 2010, at the Wayback Machine, with location map of these three districts. ^ Emeralds in the Yukon Territory Archived March 31, 2014, at the Wayback Machine. Yukon Geological Survey. ^ Cronin, David; Rendle, Andy (2012). "Determining the geographical origins of natural emeralds through nondestructive chemical fingerprinting". Journal of Gemmology. 33: 1–13. Archived from the original on November 17, 2015. ^ O'Donoghue, Michael (1988). Gemstones. Dordrecht: Springer Netherlands. p. 310. ISBN 9789400911918. Archived from the original on March 30, 2017. ^ Nassau, K. (1980) Gems Made By Man, Gemological Institute of America, ISBN 0-87311-016-1. ^ Schmetzer, Karl; Schwartz, Dietmar; Bernhardt, Heinz-Jurgen; Tobias Hager (2006–2007). "A new type of Tairus hydrothermally-grown synthetic emerald, colored by vanadium and copper" (PDF). Journal of Gemmology of Gemmological Association of Great Britain. 30 (1–2): 59–74. Archived from the original (PDF) on July 11, 2011. ^ Hurlbut, Cornelius S. Jr. and Kammerling, Robert C. (1991) Gemology, John Wiley & Sons, New York, p. 81, ISBN 0-471-52667-3. ^ Morgan, Diane (2007). From Satan's crown to the holy grail : emeralds in myth, magic, and history. Westport, Conn. [u.a. ]: Praeger. p. 171. ISBN 9780275991234. Archived from the original on March 30, 2017. Retrieved March 30, 2017. ^ Kunz, George Frederick (1915). Magic of Jewels and Charms. Philadelphia: Lippincott Company. p. 305. ISBN 0-7661-4322-8. Archived from the original on October 17, 2012. ^ "Meenakshi Temple - Meenakshi Temple of Madurai, Meenakshi Amman Temple Madurai India". www.madurai.org.uk. Archived from the original on March 17, 2016. Retrieved January 18, 2016. ^ Allen, Nick (September 24, 2010). "Judge to decide who owns 250 million Bahia emerald.html". The Daily Telegraph, UK. Archived from the original on September 28, 2010. Retrieved December 31, 2010. ^ "The Curse of the Bahia Emerald, a Giant Green Rock That Ruins Lives". wired.com. ^ Gast, Phil (September 1, 2010). "North Carolina emerald: Big, green and very rare". CNN. Cable News Network (Turner Broadcasting System, Inc.). Archived from the original on September 25, 2013. Retrieved October 8, 2013. ^ Stancill, Jane (March 16, 2012). "N.C. gems to shine at museum". The News & Observer. The News & Observer Publishing Co. Archived from the original on March 27, 2012. Retrieved October 8, 2013. ^ "Emeraude de Saint Louis - St Louis Emerald". CRPG: Le Centre de Recherches Pétrographiques et Géochimiques. Archived from the original on March 4, 2016. Retrieved February 8, 2017. ^ "Gachala Emerald". National Museum of Natural History. Smithsonian Institution. 2017. Archived from the original on February 11, 2017. Retrieved February 8, 2017. ^ "Patricia Emerald". AMNH. Archived from the original on September 5, 2015. Retrieved August 22, 2015. ^ Bouillard, J.-C. and Jeanne-Michaud, A. (2016) "101 minéraux et pierres précieuses - qu'il faut avoir vus dans sa vie". Hors collection, Dunod. ISBN 2100742272.
Cooper, J. C. (ed.) (1992). Brewer's Myth and Legend. New York: Cassell Publishers Ltd. ISBN 0-304-34084-7. Hurlbut, Cornelius S.; Klein, Cornelis (1985). Manual of Mineralogy (20th ed.). New York: John Wiley and Sons. ISBN 0-471-80580-7. Sinkankas, John (1994). Emerald & Other Beryls. Prescott, Ariz.: Geoscience Press. ISBN 0-8019-7114-4. Tavernier, Jean-Baptiste (1925 ). Travels in India (second edition), Volume II. Edited by William Crooke and translated by V. Ball. London: Oxford University Press. Weinstein, Michael (1958). The World of Jewel Stones. New York: Sheriden House. OCLC 519758. Wise, Richard W. (2003). Secrets of the Gem Trade: The Connoisseur's Guide to Precious Gemstones. Lenox, Mass. : Brunswick House Press. ISBN 9780972822398. OCLC 55662640. Online Emerald chapters. 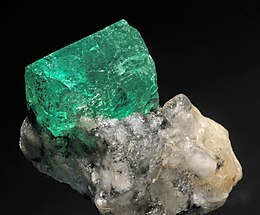 Wikimedia Commons has media related to Emeralds.